Inspired by the allure of the space age, many Americans of the 1960s took great interest in mathematics and science. One of them was the cartoonist, book illustrator, and children’s author David Crockett Johnson. From 1965 until his death in 1975 Crockett Johnson painted over 100 works relating to mathematics and mathematical physics. Of these paintings, eighty are found in the collections of the National Museum of American History. We present them here, with related diagrams from the artist’s library and papers. This painting is based on a theorem generalized by the French mathematician Blaise Pascal in 1640, when he was sixteen years old. When the opposite sides of a irregular hexagon inscribed in a circle are extended, they meet in three points. Pappus, writing in the 4th century AD, had shown in his Mathematical Collections that these three points lie on the same line. In the painting, the circle and cream-colored hexagon are at the center, with the sectors associated with different pairs of lines shown in green, blue and gray. The three points of intersection are along the top; the line that would join them is not shown. Pascal generalized the theorem to include hexagons inscribed in any conic section, not just a circle. Hence the figure came to be known as "Pascal’s hexagon" or, to use Pascal’s terminology, the "mystic hexagon." Pascal’s work in this area is known primarily from notes on his manuscripts taken by the German mathematician Gottfried Leibniz after his death. There is a discussion of Pascal’s hexagon in an article by Morris Kline on projective geometry published in James R. Newman's World of Mathematics (1956). A figure shown on page 629 of this work may have been the basis of Crockett Johnson's painting, although it is not annotated in his copy of the book. The oil or acrylic painting on masonite is signed on the bottom right: CJ65. It is marked on the back: Crockett Johnson (/) "Mystic" Hexagon (/) (Pascal). It is #10 in the series. References: Carl Boyer and Uta Merzbach, A History of Mathematics (1991), pp. 359–62. Florian Cajori, A History of Elementary Mathematics (1897), 255–56. Morris Bishop, Pascal: The Life of a Genius (1964), pp. 11, 81–7. In this oil or acrylic painting on masonite, Crockett Johnson illustrates a theorem presented by the Greek mathematician Pappus of Alexandria (3rd century AD). Suppose that one chooses three points on each of two line straight segments that do not intersect. Join each point to the two more distant points on the other lines. These lines meet in three points, which, according to the theorem, are themselves on a straight line. The inspiration for this painting probably came from a figure in the article "The Great Mathematicians" by Herbert W. Turnbull found in the artist's copy of James R. Newman's The World of Mathematics (p. 112). This figure is annotated. It shows points A, B, and C on one line segment and D, E, and F on another line segment. Line segments AE and DB, AF and DC, and BF and EC intersect at 3 points (X, Y, and Z respectively), which are collinear. Turnbull's figure and Johnson's painting include nine points and nine lines that are arranged such that three of the points lie on each line and three of the lines lie on each point. If the words "point" and "line" are interchanged in the preceding sentence, its meaning holds true. This is the "reciprocation," or principle of duality, to which the painting's title refers. Crockett Johnson chose a brown and green color scheme for this painting. The main figure, which is executed in seven tints and shades of brown, contains twelve triangles and two quadrilaterals. The background, which is divided by the line that contains the points X, Y, and Z, is executed in two shades of green. This color choice highlights Pappus' s theorem by dramatizing the line created by the points of intersection of AE and DB, AF and DC, and BC and EC. There wooden frame painted black. Reciprocation is painting #6 in this series of mathematical paintings. It was completed in 1965 and is signed: CJ65. This painting, while similar in subject to the painting entitled Perspective (Alberti), depicts three planes perpendicular to the canvas. These three planes provide a detailed, three-dimensional view of space through the use of perspective. Three vanishing points are implied (though not shown) in the painting, one in each of the three planes. The painting shows a 3-4-5 triangle surrounded by squares proportional in number to the square of the side. That is, the horizontal plane contains nine squares, the vertical plane contains sixteen squares, and the oblique plane, which represents the hypotenuse of the 3-4-5 triangle, contains twenty-five squares. This explains the extension of the vertical and oblique planes and reminds the viewer of the Pythagorean theorem. The title of this painting points to the role of the German artist Albrecht Dürer (1471–1528) in creating ways of representing three-dimensional figures in a plane. Dürer is particularly remembered for a posthumously published treatise on human proportion. In his book entitled The Life and Art of Albrecht Dürer, art historian Erwin Panofsky explains that the work of Dürer with perspective demonstrated that the field was not just an element of painting and architecture, but an important branch of mathematics. This construction may well have originated with Crockett Johnson. However, he may have been influenced by Figure 1 (p. 604) and Figure 3 (p. 608) in Panofsky’s article on Dürer as a Mathematician in The World of Mathematics, edited by James R. Newman (1956). Johnson did not annotate either of these diagrams. The oil painting was completed in 1965 and is signed: CJ65. It is #8 in his series of mathematical paintings. In ancient times, the Greek mathematician Apollonius of Perga (about 240–190 BC) made extensive studies of conic sections, the curves formed when a plane slices a cone. Many centuries later, the French mathematician and philosopher René Descartes (1596–1650) showed how the curves studied by Apollonius might be related to points on a straight line. In particular, he introduced an equation in two variables expressing points on the curve in terms of points on the line. An article by H. W. Turnbull entitled "The Great Mathematicians" found in The World of Mathematics by James R. Newman discussed the interconnections between Apollonius and Descartes, and apparently was the basis of this painting. The copy of this book in Crockett Johnson's library is very faintly annotated on this page. Turnbull shows variable length ON, with corresponding points P on the curve. The analytic approach to geometry taken by Descartes would be greatly refined and extended in the course of the seventeenth century. Johnson executed his painting in white, purple, and gray. Each section is painted its own shade. This not only dramatizes the coordinate plane but highlights the curve that extends from the middle of the left edge to the top right corner of the painting. Conic Curve, an oil or acrylic painting on masonite, is #11 in the series. It was completed in 1966 and is signed: CJ66. It is marked on the back: Crockett Johnson 1966 (/) CONIC CURVE (APOLLONIUS). It has a wooden frame. The French lawyer and mathematician Pierre de Fermat (1601–1665) was one of the first to develop a systematic way to find the straight line which best approximates a curve at any point. This line is called the tangent line. This painting shows a curve with two horizontal tangent lines. Assuming that the curve is plotted against a horizontal axis, one line passes through a maximum of a curve, the other through a minimum. An article by H. W. Turnbull, "The Great Mathematicians," published in The World of Mathematics by James R. Newman, emphasized how Fermat's method might be applied to find maximum and minimum values of a curve plotted above a horizontal line (see his figures 14 and 16). Crockett Johnson owned and read the book, and annotated the first figure. The second figure more closely resembles the painting. Computing the maximum and minimum value of functions by finding tangents became a standard technique of the differential calculus developed by Isaac Newton and Gottfried Leibniz later in the 17th century. Curve Tangents is painting #12 in the Crockett Johnson series. It was executed in oil on masonite, completed in 1966, and is signed: CJ66. The painting has a wood and metal frame. The Greek mathematician Aristotle, who lived from about 384 BC through 322 BC, believed that heavy bodies moved naturally downward, while lighter substances such as air naturally ascended. Other forms of terrestrial motion required a sustaining force, which was not expressed mathematically. The Italian Galileo Galilei (1564–1642) challenged Aristotle. He held that motion was persistent and would continue until acted upon by an opposing, outside force. In a book entitled Dialogues Concerning the Two Chief World Systems, Galileo presented his ideas in a dispute between three men: Salviati, Sagredo, and Simplicio. Salviati, a spokesman for Galileo, explained his revolutionary ideas, one of which is illustrated by a diagram that was the basis for this painting. This image can be found in Crockett Johnson's copy of The World of Mathematics, a book by James R. Newman. It is probable that this image served as inspiration for this painting, although Johnson did not annotate this diagram. In Galileo's Dialogues, Salviati argued that if a lead weight is suspended by a thread from point A (see figure) and is released from point C, it will swing to point D, which is located at the same height as the initial point C. Furthermore, Salviati stated that if a nail is placed at point E so that the thread will snag on it, then the weight will swing from point C to point B and then up to point G, which is also located at the same height as the initial point C. The same occurs if a nail is placed at point F below the line segment CD. The painting is executed in purple that progresses from light tints to darker shades right to left. This gives the figure a sense of motion akin to that of a pendulum. The background is washed in gray and black. The line created by the initial and final height of the weight divides the background. Pendulum Momentum, a work in oil on masonite, is painting #13 in the Crockett Johnson series. It was executed in 1966 and is signed: CJ66. There is a wooden frame painted black. Two circles or other similar figures can be placed such that a line drawn from some fixed point to a point of one of them passes through a point on the other, such that the ratio of the distances from the fixed point to the two points is always the same. The fixed point is called the center of similitude. The circles shown in this painting have two centers of similitude, one between the circles and one to the right (the center of similitude between the circles is shown). Crockett Johnson apparently based his painting on a diagram from the book College Geometry by Nathan Altshiller Court (1964 printing). This diagram is annotated in his copy of the book. In the figure, the larger circle has center A, the smaller circle has center B, and the centers of similitude are the points S and S'. S is called the external center of similitude and S' is the internal center of similitude. The painting suggests several properties of centers of similitude. For example, lines joining corresponding endpoints of parallel diameters of the two circles, such as TT' in the figure, would meet at the external center of similitude. Lines joining opposite endpoints meet at the internal center of similitude. 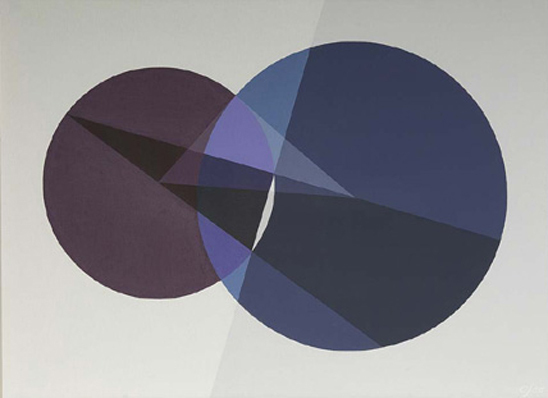 This painting emphasizes the presence of the two circles and line segments relating to centers of similitude, but not the centers themselves. Indeed, the painting is too narrow to include the external center of similitude. Some properties of centers of similitude were known to the Greeks. More extensive theorems were developed by the mathematician Gaspard Monge (1746–1818). It is not entirely clear why Crockett Johnson associated the painting with the artist and mathematician Phillipe de la Hire (1640–1718). A bibliographic note in the relevant section of Court reads: LHr., p. 42, rem. 8. However, Court was referring to an 1809 book by Simon A. J. LHuiler on the elements of analytic geometry. This oil painting on masonite is #14 in Crockett Johnson's series. It was completed in 1966 and is signed: CJ66. References: R. J. Archibald, "Centers of Similitude of Circles," American Mathematical Monthly, 22, #1 (1915), pp. 6–12; unpublished notes of J. B. Stroud. The determination of the size and shape of the Earth has occupied philosophers from antiquity. Eratosthenes, a mathematician in the city of Alexandria in Egypt who lived from about 275 through 194 BC, proposed an ingenious way to measure the circumference of the Earth. It is illustrated by this painting. Eratosthenes claimed that the town of Syene (now Aswan) was directly south of Alexandria, and that the distance between the cities was known. Moreover, he reported that on a day when the vertical rod of a sundial cast no shadow at noon in Syene, the shadow cast by a similar rod at Alexandria formed an angle of 1/50 of a complete circle. In the Crockett Johnson painting, the circle represents the Earth and the two line segments drawn from the center display the direction of the two rods. The two parallel lines represent rays of sunlight striking the Earth, the dark-purple region the shadowed area. The angle of the shadow equals the angle subtended at the center of the Earth, hence the circumference of the entire Earth can be computed when the angle and the distance of the cities is known. Crockett Johnson's painting may be after a diagram from the book by James R. Newman entitled The World of Mathematics (p. 206), although the figure is not annotated. Newman published a brief extract describing ideas of Eratosthenes, based on a first century BC account by Cleomedes. The Crockett Johnson painting is #15 in the series. It is marked on the back : Crockett Johnson 1966 (/) MEASUREMENT OF THE EARTH (/) (ERATOSTHENES). Reference: O. Pederson and M. Phil, Early Physics and Astronomy (1974), p. 53.